Shipping is not included in the price. Available for pick-up at our office. To order,call us 651-323-0101 or email us with your order detail. $1.5 $1 each. Great for school or for gift! 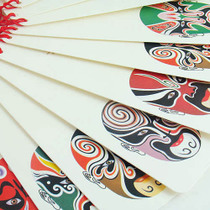 Beijing Opera face bookmarker, 12 different faces, one set contains 12 bookmarkers $10 $6 per set of 12; or 3 bookmarkers for $3 $2. Great for school or for gift! 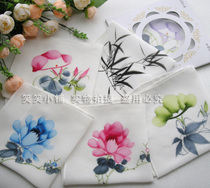 Silk handkerchief hand painted with variety of designs, 1 package contains 1 handkerchief, $2 $1 each. Great for gift! 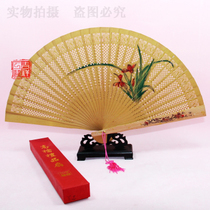 Fragrant wooden fan carved and painted with variety of designs, some black/white and some color, 1 box contains 1 fan, box color may vary, fan stand is not included, $15 $10 each box. Great for gift or display! 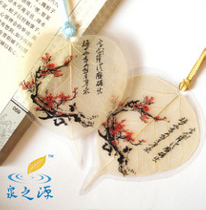 Lotus flower pen, 4 colors green, purple, pink and blue, $1.2 $1 each. Great for kids and teachers! Japanese design chopsticks, 1 box contains 1 set of 8 pairs, $18 $15 each box. Also available in 5 pairs a box, $10 $8 each box of 5-pair. Great for gift! Chopsticks with famous Chinese painting 清明上河图Qing Ming Shang He Tu design, 1 box contains 1 set of 8 pairs, $18 $15 each box. Great for gift! We are pleased to offer you some popular China maps and guidebooks in English at the lowest price. These premium quality travel publications are printed by China National Tourism Office and you can’t find them anywhere in bookstores in USA. FREE shipping for all US & Canada orders. Guidebook: 199 pages of top quality images and information on China printed on high glossy magazine quality papers. The guidebook also includes guidance to 34 China cities’ attractions, recreation, transportation, hotels, restaurants and shopping. The cities are Beijing, Changchun, Changsha, Chengdu, Chongqing, Dalian, Datong, Dunhuang, Guangzhou, Guilin, Guiyang, Hangzhou, Harbin, Huangshan, Hohhot, Kunming, Lhasa, Luoyang, Nanchang, Nanjing, Qingdao, Sanya, Shanghai, Shenyang, Shenzhen, Suzhou, Tianjin, Urumqi, Wuhan, Xian, Xining, Xiamen, and Yinchuan. Map: 34 inch (w) x 23 inch (h), printed double-side on high glossy magazine quality paper. One(1) guidebook and one (1) map each. Standard shipping to anywhere in the USA is included in the price. 127 pages of top quality images and information on Beijing printed on high glossy magazine quality papers. Contents of the book are introduction, touch Beijing, transportation, catering, accommodations, shopping, entertainment, urban attractions, religious attractions, former residence of celebrities, museums, suburban attractions, attractions on the periphery of Beijing, and recommended travel services & star-rated hotels. 127 pages of top quality images and information on Shanghai printed on high glossy magazine quality papers. Contents of the book are introduction, touch Shanghai, transportation, catering, accommodations, shopping, entertainment, urban attractions, religious attractions, former residence of celebrities, museums, suburban attractions, attractions on the periphery of Shanghai, and recommended travel services & star-rated hotels. Includes one (1) map each for China, Beijing and Shanghai, a total of three maps together. Each map: 34 inch (w) x 23 inch (h), printed double-side on high glossy magazine quality paper. Includes one (1) guidebook each for China, Beijing and Shanghai, a total of three guidebooks together. China guidebook: 199 pages of top quality images and information on China printed on high glossy magazine quality papers. The guidebook also includes guidance to 34 China cities’ attractions, recreation, transportation, hotels, restaurants and shopping. The cities are Beijing, Changchun, Changsha, Chengdu, Chongqing, Dalian, Datong, Dunhuang, Guangzhou, Guilin, Guiyang, Hangzhou, Harbin, Huangshan, Hohhot, Kunming, Lhasa, Luoyang, Nanchang, Nanjing, Qingdao, Sanya, Shanghai, Shenyang, Shenzhen, Suzhou, Tianjin, Urumqi, Wuhan, Xian, Xining, Xiamen, and Yinchuan. Beijing guidebook: 127 pages of top quality images and information on Beijing printed on high glossy magazine quality papers. Contents of the book are introduction, touch Beijing, transportation, catering, accommodations, shopping, entertainment, urban attractions, religious attractions, former residence of celebrities, museums, suburban attractions, attractions on the periphery of Beijing, and recommended travel services & star-rated hotels. Shanghai guidebook: 127 pages of top quality images and information on Shanghai printed on high glossy magazine quality papers. Contents of the book are introduction, touch Shanghai, transportation, catering, accommodations, shopping, entertainment, urban attractions, religious attractions, former residence of celebrities, museums, suburban attractions, attractions on the periphery of Shanghai, and recommended travel services & star-rated hotels. We are pleased to offer you a useful tool to book an exciting vacation that is just right for you. Voted the best reservation system by travel professional magazine Recommend, the search and booking engine is powered by award winning Travel Impression. Click here or the image below to access our online booking engine 24/7 to search or book a dream vacation to popular places in the world such as Europe, Hawaii, Caribbean, Mexico, Canada, United States and Latin America.